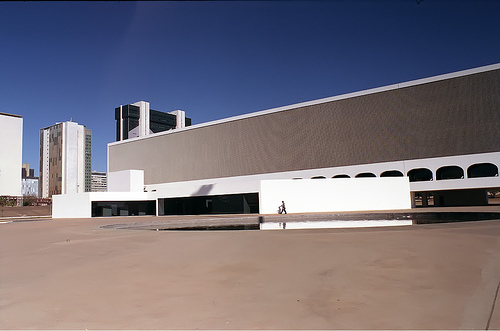 When Oscar Niemeyer designed Brasilia he had the “splendid” idea of putting all the banks in one sector, all the shopping in another, all the government buildings in big palaces with huge areas around – and all the residential space in yet another zone. Possibly this all looks mighty cool on an architect’s drawing board, but it surely must guarantee an impractical every day life for its inhabitants. Brasilia – a pedestrian’s nightmare? Oscar didn’t believe in mixed use zoning! Having a mixed use city where homes, offices, manufacturing, shops and recreation is located in the same areas makes life much easier and reduces transport needs. However, for this to work out the different sectors must not destroy for each other. For instance, a goal of the urban development movement of the 1950s that Oscar Niemeyer was a part of was to remove industry from where people lived or played – based on an assumption that industry had to be polluting. With increasingly stringent pollution regulation industrial pollution is becoming less of an issue. Road transport on the other hand is putting increasing strains on the urban environment both as a source of noise and pollutants. Building an ultra compact city with much of the road network under ground could prove to be a real enabler for good mixed use cities where it would be so pleasant to live in the city centre that this would be the preferred option. Consequently we would manage to create cities where people could stay in the same area 24-7 with all the activities and institutions they would require located within easy reach.